This article is about a process that intentionally reduces the dynamic range of audio signals. For similar reductions caused by circuit imperfections, see Gain compression. For processes that reduce the size of digital audio files, see Audio compression (data). Compression is commonly used in sound recording and reproduction, broadcasting, live sound reinforcement and in some instrument amplifiers. A dedicated electronic hardware unit or audio software that applies compression is called a compressor. In the 2000s, compressors became available as software plugins that run in digital audio workstation software. In recorded and live music, compression parameters may be adjusted to change the way they affect sounds. Compression and limiting are identical in process but different in degree and perceived effect. A limiter is a compressor with a high ratio and, generally, a fast attack time. Downward compression reduces loud sounds over a certain threshold while quiet sounds remain unaffected. Upward compression increases the loudness of sounds below a certain threshold while leaving louder sounds unaffected. Both downward and upward compression reduce the dynamic range of an audio signal. An expander performs the opposite function, increasing the dynamic range of the audio signal. Expanders are generally used to make quiet sounds even quieter by reducing the level of an audio signal that falls below a set threshold level. A noise gate is a type of expander. The signal entering a compressor is split, one copy sent to a variable-gain amplifier and the other to a side-chain where the signal level is measured and a circuit controlled by the signal level applies the required gain to an amplifier stage. This design, known as a "feed-forward" type, is used today in most compressors. Earlier designs were based on a "feedback" layout where the signal level was measured after the amplifier. There are a number of technologies used for variable-gain amplification, each having different advantages and disadvantages. Vacuum tubes are used in a configuration called "variable-mu" where the grid-to-cathode voltage changes to alter the gain. Optical compressors use a photoresistor and a small lamp (LED or electroluminescent panel) to create changes in signal gain. This technique is believed by some to sound smoother because the response times of the light and the photoresistor soften the attack and release. Other technologies used include field effect transistors and a diode bridge. When working with digital audio, digital signal processing techniques are commonly used to implement compression via digital audio editors, or dedicated workstations. Often the algorithms used emulate the above analog technologies. A compressor reduces the level of an audio signal if its amplitude exceeds a certain threshold. It is commonly set in decibels dB, where a lower threshold (e.g. -60 dB) means a larger portion of the signal is treated (compared to a higher threshold of, e.g., −5 dB). It is important to understand that when the compressor is lowering the signal to the desired ratio it is lowering the entire signal, so that the compressor is still working even after the input signal has fallen below the threshold, for an amount of time determined by the release. The highest ratio of ∞:1 is often known as 'limiting'. It is commonly achieved using a ratio of 60:1, and effectively denotes that any signal above the threshold is brought down to the threshold level (except briefly after a sudden increase in input loudness, known as an attack). A compressor might provide a degree of control over how quickly it acts. The 'attack phase' is the period when the compressor is decreasing gain to reach the level that is determined by the ratio. The 'release phase' is the period when the compressor is increasing gain to the level determined by the ratio, or, to zero dB, once the level has fallen below the threshold. The length of each period is determined by the rate of change and the required change in gain. For more intuitive operation, a compressor's attack and release controls are labeled as a unit of time (often milliseconds). This is the amount of time it takes for the gain to change a set amount of dB, decided by the manufacturer—often 10 dB. For example, if the compressor's time constants are referenced to 10 dB, and the attack time is set to 1 ms, it takes 1 ms for the gain to decrease by 10 dB, and 2 ms to decrease by 20 dB. In many compressors the attack and release times are adjustable by the user. Some compressors, however, have the attack and release times determined by the circuit design and these cannot be adjusted by the user. Sometimes the attack and release times are 'automatic' or 'program dependent', meaning that the times change depending on the input signal. Because the loudness pattern of the source material is modified by the compressor it may change the character of the signal in subtle to quite noticeable ways depending on the settings used. Another control a compressor might offer is hard/soft knee. This controls whether the bend in the response curve between below threshold and above threshold is abrupt (hard) or gradual (soft). A soft knee slowly increases the compression ratio as the level increases and eventually reaches the compression ratio set by the user. A soft knee reduces the audible change from uncompressed to compressed, especially for higher ratios where a hard knee changeover would be more noticeable. A peak sensing compressor responds to the instantaneous level of the input signal. While providing tighter peak control, peak sensing might yield very quick changes in gain reduction, more evident compression or sometimes even distortion. Some compressors apply an averaging function (commonly root mean square or RMS) on the input signal before comparing its level to the threshold. This produces a more relaxed compression that more closely relates to human perception of loudness. A compressor in stereo linking mode applies the same amount of gain reduction to both the left and right channels. This is done to prevent image shifting that can occur if each channel is compressed individually. It becomes noticeable when a loud element that is panned to either edge of the stereo field raises the level of the program to the compressor's threshold, causing its image to shift toward the center of the stereo field. Stereo linking can be achieved in two ways: Either the compressor sums to mono the left and right channel at the input, then only the left channel controls are functional; or, the compressor still calculates the required amount of gain reduction independently for each channel and then applies the highest amount of gain reduction to both (in such case it could still make sense to dial different settings on left and right channels as one might wish to have less compression for left-side events). The look-ahead function is designed to overcome the problem of being forced to compromise between slow attack rates that produce smooth-sounding gain changes, and fast attack rates capable of catching transients. Look-ahead is a misnomer in that the future is not actually observed. Instead, the input signal is split, and one side is delayed. The non-delayed signal is used to drive the compression of the delayed signal, which then appears at the output. This way a smooth-sounding slower attack rate can be used to catch transients. The cost of this solution is that the signal is delayed. Compression is often used to make music sound louder without increasing its peak amplitude. By compressing the peak (or loudest) signals, it becomes possible to increase the overall gain (or volume) of a signal without exceeding the dynamic limits of a reproduction device or medium. The net effect, when compression is applied along with a gain boost, is that relatively quiet sounds become louder, while louder sounds remain unchanged. Compression is often applied in this manner in audio systems for restaurants, retail, and similar public environments that play background music at a relatively low volume and needs it compressed, not just to keep the volume fairly constant, but also to make quiet parts of the music audible over ambient noise. Compression can increase average output gain of a power amplifier by 50 to 100% with a reduced dynamic range. For paging and evacuation systems, this adds clarity under noisy circumstances and saves on the number of amplifiers required. Compression is often used in music production to make performances more consistent in dynamic range so that they "sit" in the mix of other instruments better and maintain consistent attention from the listener. Vocal performances in rock music or pop music are usually compressed to make them stand out from the surrounding instruments and add clarity. Compression can also be used on instrument sounds to create effects not primarily focused on boosting loudness. For instance, drum and cymbal sounds tend to decay quickly, but a compressor can make the sound appear to have a more sustained tail. Guitar sounds are often compressed to produce a fuller, more sustained sound. Most devices capable of compressing audio dynamics can also be used to reduce the volume of one audio source when another audio source reaches a certain level, this is called side-chaining. In electronic dance music, side-chaining is often used on basslines, controlled by the kick drum or a similar percussive trigger, to prevent the two conflicting, and provide a pulsating, rhythmic dynamic to the sound. A compressor can be used to reduce sibilance ('ess' sounds) in vocals by feeding the compressor with an EQ set to the relevant frequencies, so that only those frequencies activate the compressor. If unchecked, sibilance could cause distortion even if sound levels are not very high. This usage is called de-essing. Compression is used in voice communications in amateur radio that employ SSB modulation. Often it is used to make a particular station's signal more readable to a distant station, or to make one's station's transmitted signal stand out against others. This occurs especially in pileups where amateur radio stations are competing for the opportunity to talk to a DX station. Since an SSB signal's amplitude depends on the level of modulation, the net result is that the average amplitude of the signal and hence average transmitted power would be stronger than it would be had compression not been used. Most modern amateur radio SSB transceivers have speech compressors built in. Compression is also used in land mobile radio, especially in transmit audio of professional walkie-talkies and in remote control dispatch consoles. Compression is used extensively in broadcasting to boost the perceived volume of sound while reducing the dynamic range of source audio (typically CDs) to a range that can be accommodated by the narrower-range broadcast signal. Broadcasters in most countries have legal limits on instantaneous peak volume they may broadcast. Normally these limits are met by permanently inserted hardware in the on-air chain (see multiband compression above). As was alluded to above, the use of compressors to boost perceived volume is a favorite trick of broadcasters who want their station to sound "louder" at the same volume than comparable stations on the dial. The effect is to make the more heavily compressed station "jump out" at the listener at a given volume setting. But loudness jumps are not limited to inter-channel differences; they also exist between programme material within the same channel. Loudness differences are a frequent source of audience complaints, especially TV commercials and promos that seem too loud. Complicating this is that many broadcasters use (quasi-)peak meters and peak-levelling. Unfortunately the peak level reading does not correlate well with the perceived loudness. It basically should only be used to prevent overmodulation. The European Broadcasting Union has been addressing this issue in the EBU PLOUD Group, which consist of over 240 audio professionals, many from broadcasters and equipment manufacturers. In 2010, the EBU published EBU Recommendation R 128, which introduces a new way of metering and normalising audio. The Recommendation is based on ITU-R BS.1770 and could be called a real 'audio revolution'. Several European TV stations have already announced to support the new norm and over 20 manufacturers have announced products supporting the new 'EBU Mode' Loudness meters. To help audio engineers understand what Loudness Range their material consists of (e.g. to check if some compression may be needed to fit it into the channel of a specific delivery platform), the EBU also introduced the Loudness Range Descriptor. The trend of increasing loudness as shown by waveform images of the same song mastered on CD four times since 1983. Record companies, mixing engineers and mastering engineers have been gradually increasing the overall volume of commercial albums. The greater loudness is achieved by using higher degrees of compression and limiting during mixing and mastering; compression algorithms have been engineered specifically to accomplish the task of maximizing audio level in the digital stream. Hard limiting or clipping can result, affecting the tone and timbre of the music. The effort to increase loudness has been referred to as the loudness war. Most television commercials are compressed heavily (typically to a dynamic range of no more than 3 dB) to achieve near-maximum perceived loudness while staying within permissible limits. This is the explanation for a problem that TV viewers and listeners have noticed for years: While commercials receive heavy compression for the same reason that radio broadcasters have traditionally used it (to achieve a "loud" audio image), TV program material, particularly old movies with soft dialogue, is comparatively uncompressed by TV stations. This results in commercials much louder than the television programs. A compressor is sometimes used to reduce the dynamic range of a signal for transmission, to be expanded afterward. This reduces the effects of a channel with limited dynamic range. See Companding. Bass amplifiers and keyboard amplifiers often include compression circuitry, to protect the speakers from sudden high-wattage peaks that could damage the speakers. Electric bass players often use compression effects, either effects units available in pedal, rackmount units, or built-in devices in bass amps, to even out the sound levels of their basslines. Gain pumping, where a regular amplitude peak (such as a kick drum) causes the rest of the mix to change in volume due to the compressor, is generally avoided in music production. However, many dance and hip-hop musicians purposefully use this phenomenon, causing the mix to alter in volume rhythmically in time with the beat. A compressor is used in hearing aids to bring the audio volume into the listener's hearing range. To enable the patient to perceive the direction from which the sound is coming, binaural compression may be required. Compressors are also used for hearing protection in some electronic "active sound protection" earmuffs and earplugs, to let sounds at ordinary volumes be heard normally while attenuating louder sounds, possibly also amplifying softer sounds. This allows, for example, shooters wearing hearing protection at a shooting range to converse normally, while sharply attenuating the much louder sounds of the gunshots, and similarly for musicians to hear quiet music but be protected from loud noises such as drums or cymbal crashes. Limiting and clipping compared. Note that clipping introduces a large amount of distortion whereas limiting only introduces a small amount while keeping the signal within the threshold. Compression and limiting are identical in process but different in degree and perceived effect. A limiter is a compressor with a high ratio and, generally, a fast attack time. Compression with ratio of 10:1 or more is generally considered limiting. Brick wall limiting has a very high ratio and a very fast attack time. Ideally, this ensures that an audio signal never exceeds the amplitude of the threshold. Ratios of 20:1 all the way up to ∞:1 are considered 'brick wall'. The sonic results of more than momentary and infrequent hard/brick-wall limiting are harsh and unpleasant, thus it is more common as a safety device in live sound and broadcast applications. Some bass amps and PA system amplifiers include limiters to prevent sudden volume peaks from causing distortion and/or damaging the speakers. Some modern consumer electronics devices incorporate limiters. Sony uses the automatic volume limiter system (AVLS), on some audio products and the PlayStation Portable. The first 8 bars are without side-chaining applied, the second 8 are with side-chaining. 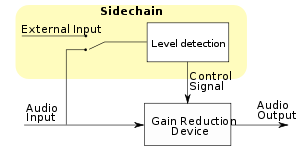 A compressor with a side-chain input controls gain from main input to output based on the level of the signal at the side-chain input. The compressor behaves in the conventional manner when both inputs are supplied with the same signal. The side-chain input is used by disc jockeys for ducking – lowering the music volume automatically when speaking. The DJ's microphone signal is routed to the side-chain input so that whenever the DJ speaks the compressor reduces the volume of the music. A sidechain with equalization controls can be used to reduce the volume of signals that have a strong spectral content within a certain frequency range: it can act as a de-esser, reducing the level of vocal sibilance in the range of 6–9 kHz. A de-esser helps reduce high frequencies that tend to overdrive preemphasized media (such as phonograph records and FM radio). Another use of the side-chain in music production serves to maintain a loud bass track without the bass drum causing undue peaks that result in loss of overall headroom. One technique is to insert the compressor in a parallel signal path. This is known as parallel compression, a form of upward compression, which can give a measure of dynamic control without significant audible side effects, if the ratio is relatively low and the compressor's sound is relatively neutral. On the other hand, a high compression ratio with significant audible artifacts can be chosen in one of the two parallel signal paths—this is used by some concert mixers and recording engineers as an artistic effect called New York compression or Motown compression. Combining a linear signal with a compressor and then reducing the output gain of the compression chain results in low-level detail enhancement without any peak reduction (since the compressor significantly adds to the combined gain at low levels only). This is often beneficial when compressing transient content, since it maintains high-level dynamic liveliness, despite reducing the overall dynamic range. Multiband compressors can act differently on different frequency bands. The advantage of multiband compression over full-bandwidth compression is that unneeded audible gain changes or "pumping" in other frequency bands is not caused by changing signal levels in a single frequency band. Multiband compressors work by first splitting the signal through some number of band-pass filters or crossover filters. The frequency ranges or crossover frequencies may be adjustable. Each split signal then passes through its own compressor and is independently adjustable for threshold, ratio, attack, and release. The signals are then recombined and an additional limiting circuit may be employed to ensure that the combined effects do not create unwanted peak levels. Software plug-ins or DSP emulations of multiband compressors can be complex, with many bands, and require corresponding computing power. Multiband compressors are primarily an audio mastering tool, but their inclusion in digital audio workstation plug-in sets is increasing their use among mix engineers. On-air signal chains of radio stations commonly use hardware multiband compressors to increase apparent loudness without fear of overmodulation. Having a louder sound is often considered an advantage in commercial competition. However, adjusting a radio station's multiband output compressor requires some artistic sense of style, plenty of time, and good ears. This is because the constantly changing spectral balance between audio bands may have an equalizing effect on the output, by dynamically modifying the on-air frequency response. A further development of this approach is programmable radio output processing, where the parameters of the multiband compressor automatically change between different settings according to the current programme block style or the time of day. Serial compression is a technique used in sound recording and mixing. Serial compression is achieved by using two fairly different compressors in a signal chain. One compressor generally stabilizes the dynamic range while the other aggressively compress stronger peaks. This is the normal internal signal routing in common combination devices marketed as compressor-limiters, where an RMS compressor (for general gain control) is followed by a fast peak sensing limiter (for overload protection). Done properly, even heavy serial compression can sound natural in a way not possible with a single compressor. It is most often used to even out erratic vocals and guitars. Some software audio players support plugins that implement compression. These can increase perceived volume of audio tracks, or even out the volume of highly-variable music (such as classical music, or a playlist that spans multiple music types). This improves listenability of audio played through poor-quality speakers, or when played in noisy environments (such as in a car or during a party). Such software may also be used in micro-broadcasting or home-based audio mastering. In an article released in January 2014 by the Journal of the Audio Engineering Society, Emmanuel Deruty and Damien Tardieu performed a systematic study describing the influence of compressors and brickwall limiters on the musical audio signal. The experiment involved four software limiters: Waves L2, Sonnox Oxford Limiter, Thomas Mundt’s Loudmax, Blue Cat’s Protector, as well as four software compressors: Waves H-Comp, Sonnox Oxford Dynamics, Sonalksis SV-3157, and URS 1970. The study provides objective data on what limiters and compressors do to the audio signal. Five signal descriptors were considered: RMS power, EBU3341/R128 integrated loudness, crest factor, EBU3342 LRA, and density of clipped samples. RMS power accounts for the signal's physical level, EBU3341 loudness for the perceived level. The crest factor, which is the difference between the signal's peak and its average power, is on occasions considered as a basis for the measure of micro-dynamics, for instance in the TT Dynamic Range Meter plug-in. Finally, EBU3342 LRA has been repeatedly considered as a measure of macro-dynamics or dynamics in the musical sense. increase of clipped sample density. In other words, limiters increase both physical and perceptual levels, increase the density of clipped samples, decrease the crest factor and decrease macro-dynamics (LRA) given that the amount of limiting is substantial. As far as the compressors are concerned, the authors performed two processing sessions, using a fast attack (0.5 ms) in one case, and a slow attack (50 ms) in the other. Gain make-up is deactivated, but the resulting file is normalized. slight decrease of clipped sample density. In other words, fast-attack compressors increase both physical and perceptual levels, but only slightly. They decrease the density of clipped samples, and decrease both crest factor and macro-dynamics. no influence on clipped sample density. In other words, slow-attack compressors decrease both physical and perceptual levels, decrease macro-dynamics, but have no influence on crest factor and clipped sample density. ↑ Follansbee, Joe (2006). Hands-on Guide to Streaming Media: An Introduction to Delivering On-Demand Media. Focal Press. p. 84. ISBN 9780240808635. ↑ Rick Jeffs; Scott Holden; Dennis Bohn (September 2005). "RaneNote 155: Dynamics Processors – Technology & Applications" (PDF). Rane Corporation. Retrieved 2012-12-21. ↑ "Compression in Audio Music Mixing". Retrieved 2013-12-07. ↑ Robert E. Sandlin (2000). Textbook of Hearing Aid Amplification. Cengage Learning. ISBN 9781565939974. 1 2 Maureen Droney; Howard Massey. "Compression Applications" (PDF). TC Electronic. Archived from the original (PDF) on 2010-12-31. 1 2 Justin Colletti (June 27, 2013). "Beyond The Basics: Sidechain Compression". Retrieved 2015-03-16. ↑ Mike Senior. "Techniques For Vocal De-essing". Retrieved 2015-03-16. 1 2 3 Emmanuel Deruty; Damien Tardieu (January 2014). "About Dynamic Processing in Mainstream Music". Journal of the Audio Engineering Society. Retrieved 2014-06-06. (subscription required (help)). ↑ Blue Cat Audio. "Protector". ↑ Waves. "H-Comp Hybrid Compressor". ↑ Unique Recording Software. "URS 1970 Classic Console Compressor Limiter". ↑ Earl Vickers (November 4, 2010). "The Loudness War: Background, Speculation and Recommendations" (PDF). AES 2010: Paper Sessions: Loudness and Dynamics. San Francisco: Audio Engineering Society. Retrieved July 14, 2011. ↑ Deruty, Emmanuel (September 2011). "'Dynamic Range' & The Loudness War". Sound on Sound. Retrieved 2013-10-24. ↑ "Measuring the Evolution of Contemporary Western Popular Music". Scientific Reports. 2. 26 July 2012. doi:10.1038/srep00521. Retrieved 26 July 2012. ↑ Jens Hjortkjær; Mads Walther-Hansen (January 2014). "Perceptual Effects of Dynamic Range Compression in Popular Music Recordings". Journal of the Audio Engineering Society. Retrieved 2014-06-06. (subscription required (help)). ↑ Esben Skovenborg (April 2012). "Loudness Range (LRA) – Design and Evaluation". AES 132nd Convention. Retrieved 2014-10-25. (subscription required (help)).